This trip to Taipei was not of my choice, but it turned out to be one of those places I'll come back again and again. The food there is to die for! In fact, I went to Taiwan for my overseas military training and the last 3 days were R&R for us. Taipei was our destination. Everyone was looking forward to these 3 days with exploding enthusiasm simply because we want to put the tough training and sleepless nights behind us. It was really crazy there! Different platoons were allocated to different hotels in various parts of the city. 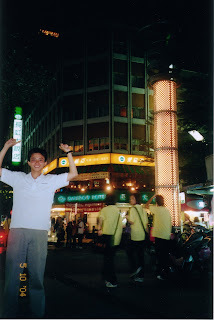 As luck would have it, my platoon's hotel happened to be in the heart of Taipei's hottest shopping district--Xi Men Ding. It is akin to the Orchard Rd in Singapore. Rainbow Hotel (See picture above) was the place I stayed in. Quite a decent place. The hotel is surrounded by endless shops and food stalls and I didn't know where to begin my arduous task of "conquering them all". The streets are filled with make-shift carts selling all kinds of fried delicacies a nd they are too tempting to resist. Of course, if you are a hygiene freak, then maybe those food are not for you. You won't want to see how they prepare their food! Bubble milk tea stalls are everywhere too. And they are really cheap. And I felt that those tasted much better than the ones I find in Singapore. Even the "pearl" inside the bubble tea taste a bit different! 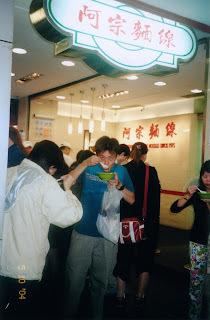 Anyhow, if you happen to go to Xi Men Ding, you must absolutely try the Mee Suah there (See Picture on the right). Next you should take the MRT and go to Shilin Night Market--another popular shopping and food paradise. When you are there, you must eat the Fried Chicken Cutlet. The locals say that is the best Fried Chicken Cutlet in Taiwan. Is it the best? I'm not sure. But I think that it is definitely one of the biggest. I shared that with 2 other friends. If you are up for it, then I suggest that you go to Huansi Street Night Market. I almost freaked out when I was there. That is the place where you can find Snake meat. Actually, the thought of eating Snake meat wasn't that scary. But when I was there, my friend and I were deliberating whether we should eat it or not. Maybe because it was the environment there that made us uncomfortable. And it was not that cheap either. But since we were there already, and probably never will try it again, we decided to share one set meal of Snake delicacy. It was then served on a tray with a cup of snake blood, meat, soup, and a pill. Quite freaky. People say that Snake meat tasted like Chicken. But I think it tasted like more than chicken. It has a funny blend smell and taste to it. Can't really describe it. But it tasted funny. Maybe because of the blood there too! In the day, there was a guided tour by an agency that brought us around. We went to Leofoo Amusement Park, where I get to be a kid again. Imagine a few hundred army guys going to an amusement park. That sight is amusing in itself! 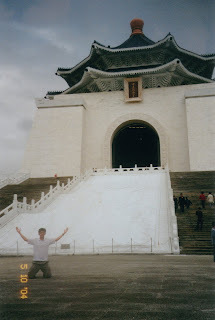 We also went to the Chiang Kai-shek Memorial Hall and a few other museums. 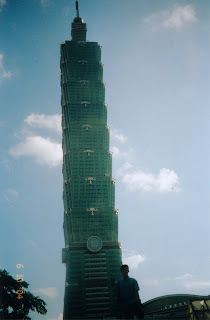 The last day, my friend and I went to Taipei 101--the tallest building in the world. What a sight! That is really an architecture and engineering feat. Really cool! The sad part about the whole thing was that the observational deck was not yet open to the public at that time. So we couldn't go to the top of the world's tallest building. Yes, a pity. But we did manage to go to Taipei 101 shopping center to window shop. You bet that I'll be back! The trip was really enjoyable albeit a short period of time. It was the exploring and going to places on my own that made it exciting. For the most part, I took their MRT to most of the places and only took the taxi only once. I always believe that in other for me to know more about another country, I should experience taking their mass public transportation. It got me to understand and experience their way of commuting. And by the way, the people there are really disciplined and courteous as they would form 2 orderly lines at each train's door, allowing people from the train to alight first. Really neat! With our limited budget, my friend and I should be proud of ourselves because we explored many places that our platoon mates didn't go. Most of them spent their money shopping, going to clubs, night spots, etc. So it was an excellent trip and I thank my Platoon mate, Johnathan for accompanying me to explore Taipei. Did I mention that the food there is to die for? I want to go for more of such trips because I know that Life Will NEVER, EEEE...EE..EVER, Be The Same AGAIN!